This book summarizes recent progresses in inorganic fluorine chemistry. Highlights include new aspects of inorganic fluorine chemistry, such as new synthetic methods, structures of new fluorides and oxide fluorides, their physical and chemical properties, fluoride catalysts, surface modifications of inorganic materials by fluorination process, new energy conversion materials and industrial applications. Fluorine has quite unique properties (highest electronegativity; very small polarizability). In fact, fluorine is so reactive that it forms fluorides with all elements except with the lightest noble gases helium, neon and argon. Originally, due to its high reactivity, fluoride chemistry faced many technical difficulties and remained undeveloped for many years. Now, however, a large number of fluorine-containing materials are currently produced for practical uses on an industrial scale and their applications are rapidly extending to many fields. Syntheses and structure analyses of thermodynamically unstable high-oxidation-state fluorides have greatly contributed to inorganic chemistry in this decade. Fluoride catalysts and surface modifications using fluorine are developing a new field of fluorine chemistry and will enable new syntheses of various compounds. The research on inorganic fluorides is now contributing to many chemical energy conversion processes such as lithium batteries. Furthermore, new theoretical approaches to determining the electronic structures of fluorine compounds are also progressing. On the industrial front, the use of inorganic fluorine compounds is constantly increasing, for example, in semi-conductor industry. 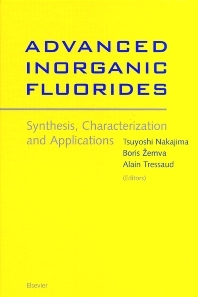 "Advanced Inorganic Fluorides: Synthesis, Characterization and Applications" focuses on these new features in inorganic fluorine chemistry and its industrial applications. The authors are outstanding experts in their fields, and the contents of the book should prove to be of valuable assistance to all chemists, graduates, students and researchers in the field of fluorine chemistry. Chemists, graduates, students and researchers in the field of Fluorine chemistry. Recent developments in the synthesis of inorganic fluorides. (K. Lutar, H. Borrmann, M. Leblanc). Low valent transition metal fluorides. (H.C.S. Clark, J.H. Holloway). High oxidation state transition metal fluorides. (B. &Zcaron;emva). Syntheses and structures of the oxide fluorides of the main-group and transition metal elements. (M. Garken, H.P.A Mercier, G.J. Schrobilgen). Oxide fluorides of rare earth elements. (M. Takashima). Oxyfluorinated open frameworks. (G. Férey, T. Loiseau, D. Riou). Optical properties and applications of fluoride glasses. (J.-L. Adam). Magnetic properties of usovite and jarlite derivative compounds. (J. Darriet, A. Le Lirzin, R. Georges). Luminescent properties of fluorides. (C. Fouassier). Superacidic reaction media. (T.A. O'Donnell). Fluoride catalysts: their application to heterogeneous catalytic fluorination and related processes. (E. Kemnitz, J.M. Winfield). Chemistry in perfluorinated organic solvents. (E.G. Hope, A.M. Stuart). Surface modification of inorganic materials by fluorination treatments. (C. Cardinaud, A. Tressaud). Fluorinated carbon materials for energy conversion. (T. Nakajima ). Fluorine compounds in battery applications. (K. Kanamura). Fluorinated fullerenes. (H. Touhara, F. Okino). Fluorinated pitch. (H. Fujimoto, T.Maeda). Applications of fluorides to semiconductor industries. (F. Ishii, Y. Kita). Industrial applications of inorganic fluorides. (D.T. Meshri).